I have heard so much about the number “eight” in our church’s beginning. Eight brothers were baptized at 8.00pm on the 8th of August and the year was the 8th anniversary of the independence of Singapore. I was so intrigued by the supernatural beginning of our church that I wanted to know more. So many questions came to mind. I was glad to get some of the answers to these questions through an interview with four of the eight persons who were first to be baptized. They are Philip Lee, Zach Wong, Newman Tay and Abraham Chan. This is their account of our church’s birth in revival fire. It all began when a group of believers from Dunearn Secondary Technical School were invited to a church where they witnessed the manifestation of the Holy Spirit. Quite fascinated by this experience, they began searching the Scriptures concerning the Holy Spirit. To be sure that this experience was from the Lord, they also fasted and prayed for guidance and revelation. On July 15th 1972, an important date on his calendar, Philip Lee was filled with the Holy Spirit. Incomprehensible utterance poured out of his lips. It was an awesome experience which was too good to be hoarded. Bubbling with joy, Philip hopped on his bicycle and raced to Paul Seow’s house which was half a mile away. Paul was one of the students who was fasting and praying regarding the Holy Spirit. Not only did Philip tell Paul about the Holy Spirit, he laid hands and prayed for Paul to receive the Holy Spirit. That night, Paul received the Holy Spirit too. The next day in school, they did not hesitate to share the Lord’s blessing with Newman Tay, Simeon, Zach Wong and the other believers. They met at a secluded spot behind the science laboratory which later become their regular holy ground. This secluded area was also staked out by other students for an forbidden activity – smoking. They prayed before class, during recess and after school. Praying in tongues was not exactly a quiet form of worship. Out of curiosity, other students came to watch when they prayed. They were labelled as “fanatics” by students and teachers who did not understand the gift of speaking in tongues. Of course, such opposition produced fear and anxiety about sharing Christ with other students. But their fear for the Lord was greater than their fear of men and they preached the Gospel boldly in the power of the Holy Spirit. Before long the school was aflame with the Gospel message. The students continued to meet after school for prayer and Bible Study. Many of our brothers and sisters were attending Youth for Christ at that time, but they realized that they needed to attend church. But which church? God is all knowing, and in His sovereignty, He set up a crucial link between them and brother Matthew, later to be the founder of World Revival Prayer Fellowship. Who is brother Matthew? Where did he come from? Well, one evening in Kuala Lumpur, Malaysia, brother Matthew heard the voice of the Lord telling him to go to Singapore to work. On the following day, God confirmed His call through a job opening in Singapore. Obedient to God’s call, brother Matthew took up the chief accountant’s post at Castrol Singapore. The crucial link mentioned earlier was a student by the name of Mamohan Singh. Mamohan was a fellow believer studying at Dunearn Secondary Technical School in a different class from Philip, Paul and the others. A quiet humble person he had been observing the noisy prayer meeting for some time. He told the students that he knew of a man who worshiped in a similar fashion. This news excited them. They met up with brother Matthew and started attending meetings at his home at No. 14, Jalan Dermawan. The rest as they say is history but for us it was the beginning. Those who were filled with the Holy Spirit were encouraged to be baptized in water in accordance with the Scriptures. Philip, Paul, Peter, Newman and Simeon decided to get baptized. A baptism date was set. It was on a Friday evening. The youths, as was their practice, attended the weekly Youth for Christ meeting. With excitement, they shared with the speaker about their coming baptism. At the end of their discussion they were thoroughly confused. Apparently, the speaker had been dissuading them from taking water baptism from brother Matthew because he was unknown in Singapore’s Christian circle. Doubts crept in and thoughts of postponing the baptism swamped their minds. Perplexed and concerned about the events of the day, Newman visited brother Matthew. Upon seeing brother Matthew, before Newman could relate about the confusion, brother Matthew told him he knew what he was about to say. Newman was amazed. Together they prayed and believed that God would remove all the hindrances and the water baptism would proceed as planned. Later, Newman met up with the rest of the baptism candidates and related to them all that brother Matthew had told him. The five baptism candidates were convinced that it was God’s will for them to be baptized. Three others, Timothy, Zach and Abraham came to observe and encourage the candidates but they also ended up in water way over their heads! Thus that evening, at the Kranji river, eight students were baptized at 8.00pm on the 8th of August and on the eve of the eighth National Day of Singapore. These brothers were the pioneers of a great Holy Spirit revival. How did this revival spread? Being baptized and filled with the Holy Spirit, they continued to attend Youth for Christ meetings where they shared about their new found experiences. At that time, Dunearn Youth for Christ joined with other schools at combined fellowship meetings. 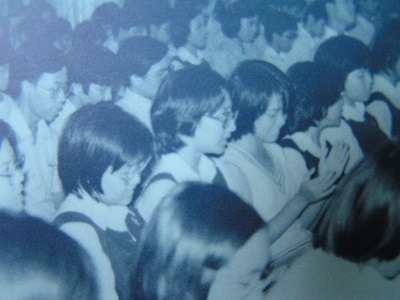 It was at these combined Youth for Christ meetings that news of the baptism of the Holy Spirit and its manifestation spread rapidly among students in other schools like Anderson, Raffles Girls, Tanjong Katong, etc. Many curious students visited 14 Jalan Dermawan. At first, a few came, then more came and soon they came in bus loads. On Saturdays and Sundays, bus no. 173 would be packed with students up to a certain bus stop outside Jalan Dermawan. After that, it emptied. There was a watchword in those days, “Go to 14 Jalan Dermawan and you will receive the Holy Spirit.” Many who came for the first time were deeply convicted and experienced the baptism of the Holy Spirit and spoke in tongues. When such a large group of young people met frequently it was natural that some would become susceptible to feelings of infatuation and sexual attraction. Therefore, a fair amount of teaching was devoted to social behaviour, discipline and dressing. Guys and gals sat separately on opposite sides of the aisle so that the Lord’s name may not be ill spoken of by parents and neighbours. At the same time, there was considerable teaching on doctrinal issues establishing them in their faith and Christian understanding. The number of people attending the church continued to grow so rapidly that the living room was too small for the meetings. The flood of students to 14 Jalan Dermawan did not go unnoticed either as our form of worship being charismatic in expression was not what you might call quiet. Following complaints by neighbours about noise, the police were on several occasions at the gate. Simon Tan was always ready with his Bible to convince the police that our worship was similar with that of the first century Christians! At this point, the fellowship realized that they had to look for a place that can accommodate more people, with an affordable rent and in a neighbourhood that would tolerate our mode of worship. That place turned out to be No. 14 Lengkok Saga. After a while, Bro Matthew left for Canada and he appointed Pastor P.J Johney to replace him. A new chapter began and we continued to grow and experience God’s love and power. At the end of the interview, the four brothers shared some deep impressions about the early years of World Revival Prayer Fellowship with the hope of spurring us to greater zeal and love. These features of a genuine supernatural revival need not remain trapped and vacuum-packed in our past. The same Holy Spirit desires to fan aflame our present congregation into a vibrant prayerful and caring people who will obey the Great Commission.